The Saab 35 was designed to have a speed 50% greater than any other fighter entering service at that time. Although not designed to be a dogfighter, the J 35 Draken proved to have good instantaneous turn capability and was a very capable fighter. It entered service in 1960 with the Swedish Air Force; 644 Saab Drakens were built for Sweden as well as other European nations. Sweden's Draken fleet came in six different variants while two Draken models were offered for export. The early models were intended purely for air defence. The last model built was the J 35F, the final variant to remain in Swedish service. These aircraft were retired in the 1990s and replaced by the Saab Gripen. The J 35 Draken design underwent several upgrades. The last was the J 35J version, in the late 1980s, although by then, the Draken had been almost totally replaced by the Saab 37 Viggen in Swedish service. The J 35J was a service-life extension program since the delivery of the new Saab JAS 39 Gripen was still in the development stage and suffering from delivery delays. The extension program was to keep the Draken flying into the 2000s, but due to cutbacks and high maintenance costs the Draken was eventually phased out. The Swedish Drakens were officially retired in December 1998, although the type remains in limited numbers in both military and civilian versions. Export customers included Denmark and Finland. In 1985, the Austrian Air Force purchased 24 J 35D s reconditioned by Saab, designated J 35F. All Drakens are interceptors with limited air-to-ground capability, with the sole exception of the Danish Drakens, which are strike aircraft capable of carrying AGM-12 Bullpup missiles, advanced "jammers", and increased internal and external fuel stores. The Danish Drakens are so far the heaviest of the series to have been in service. Danish F-35 aircraft were retired in 1993. Finland updated its 35X fleet with new avionics, cockpit displays, navigational/attack systems and electronic countermeasures during the 1990s but finally retired the Draken in 2000. 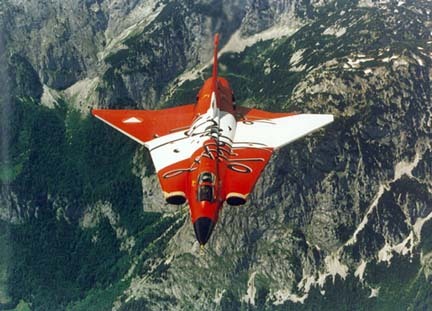 Austria was the last country to operate the Draken in military service. They bought refurbished J 35D which was the last variant with two internal cannon due to the Austrian restriction of not being allowed to carry air-to-air missiles. These Drakens were retired in 2005, when they were replaced by former Swiss Tiger IIs, while waiting for new Eurofighters. In the United States, the National Test Pilot School (NTPS) owns six Drakens that were formerly in Danish service; of these, two TF-35XD s and one RF-35XD are operational, based at the Mojave Spaceport. As the jet era started, Sweden foresaw the need for a jet fighter that could intercept bombers at high altitude and also successfully engage fighters. Although other interceptors such as the US Air Force's F-104 Starfighter were being conceived during the same period, Saab's "Draken" would have to undertake a combat role unique to Sweden. Other demanding requirements were the capability to operate from reinforced public roads used as part of wartime airbases, and for refuelling/rearming to be carried out in no more than ten minutes, by conscripts with minimal training. In September 1949, the Swedish Defence Material Administration issued a request for a fighter/interceptor aircraft, and work began at Saab the same year. Draken's design incorporated a distinctive "double-delta" configuration, with one delta wing within another larger delta. The inner wing has an 80 degrees angle for high speed performance, while the outer 60 degrees wing gives good performance at low speeds. Propulsion was provided by a single Svenska Flygmotor RM 6B/C turbojet (Rolls-Royce Avon 200/300 bult under license). A ram turbine, under the nose, provided emergency power and the engine had a built-in emergency starter unit. The Draken could deploy a drag chute to reduce its landing distance. The double-delta shape was so revolutionary that it warranted the only sub-scale test aircraft built in Sweden: the Saab 210, unofficially nicknamed "Lilldraken" (the little kite). The Saab 210 tested the concept of the double delta, first flying on 21 January 1952. The 210's successful testing results led to an order for three full-size Draken prototypes. The first prototype, not fitted with an afterburner, made its maiden flight on 25 October 1955. The second prototype, equipped with an afterburner, unintentionally broke the sound barrier on its first flight while climbing.